This recipe will bring out the southern drawl in anyone. It’s great for any game meat but extra special with bear. 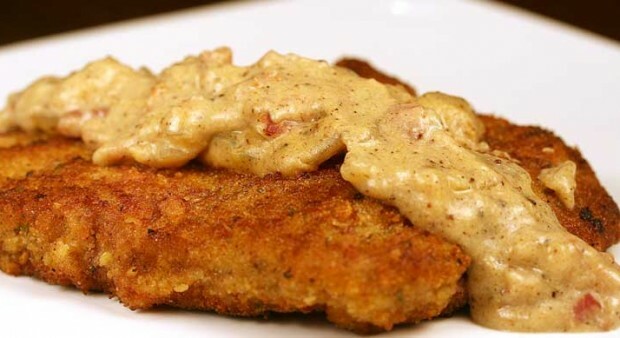 It uses a blended creole seasoning mix recipe, which are also included. dried sweet basil 1 tbsp. Blend together in a food processor. Store in an airtight container. Place the bear steak on a piece of plastic wrap and cover with another piece of plastic wrap. Pound steak with a meat mallet until it’s ¼ inch thick. Season both sides of meat with 1 tsp. of creole seasoning. Fry the bacon in a large, heavy skillet until just crisp. Remove and drain. Set pan with the bacon grease aside. Prepare 3 bowls to dredge the meat. Into the first bowl, add 1 cup flour and 1 tbsp. creole seasoning. To the second bowl, add egg whisked with ½ cup milk and ½ tsp. creole seasoning. Into the third bowl, add bread crumbs mixed with all but ½ tsp of remaining creole seasoning. Dredge the meat in the first bowl, shake off any excess, then dip in second bowl and again shake off excess, then roll in crumb mixture. Repeat with all steaks. Reheat the bacon fat in skillet until hot, but not smoking. Carefully add 1 piece of meat and fry until golden, about 3 to 4 minutes per side. Transfer to paper towel to drain, repeat with other pieces of meat. Add ¼ cup flour and ½ tsp. of creole seasoning to drippings in pan. Cook over medium heat, stirring constantly for 2 minutes. Add onion and cook, stirring until onions soften, about 4 minutes. Whisk in remaining milk and salt and pepper and bring to a boil. Reduce heat to low and simmer until sauce is thickened, about 5 minutes. Stir in bacon. Serve with steaks.